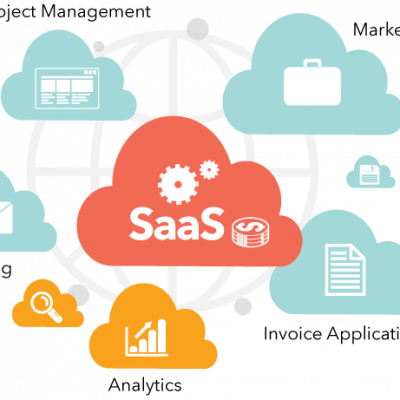 SaaS, or Software as a Service, forever changed the way that software would be bought, sold, and consumed. Gone are the days of CD-ROMs bought in-store; today’s software requires no physical form and can be instantly downloaded from the cloud. Consumers now purchase the software online, pay a recurring subscription fee, and receive access to the software and all subsequent updates. What Does This Change for Consumers? The Software as a Service model simplifies the lives of customers, and provides a predictable revenue stream for the company. Instead of charging one-time purchase fees, customers pay smaller, subscription-based fees that the company can rely on. This recurring revenue means that the growth of SaaS companies is more predictable, allowing them to scale much faster and with much less risk than other companies. Additionally, the online licensing model means that the software can only be accessed by paying customers, further funding the legitimacy and profits of the company. 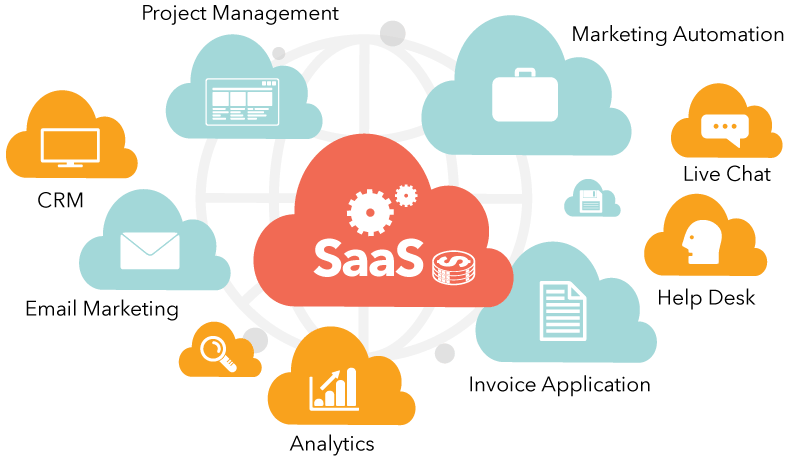 SaaS has become the dominant philosophy in providing software. In fact, most of the software you use runs under this model. 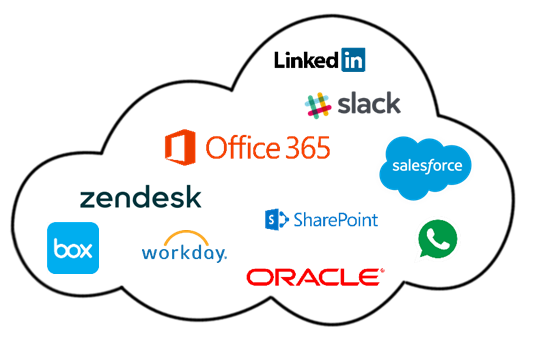 If you’ve ever used Microsoft Office 365, Box, SharePoint, Oracle, or Salesforce at work, you’ve used SaaS. Additionally, many of the apps you use every day are built with this modeling, including Facebook, LinkedIn, Netflix, and messaging apps. Where Will The Industry Go from Here? With so many well-known companies built around SaaS it’s easy to assume the industry is stagnating. 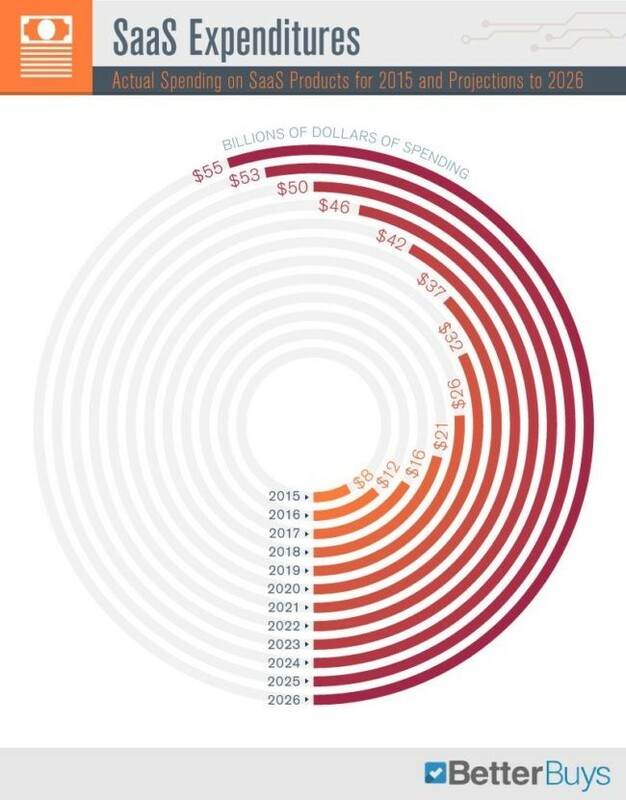 This, however, is not the case; growth is still rapid within the industry. Cisco predicts that 83% of all data center traffic will be based in the cloud within the next three years. This fundamental switch to the cloud will continue to drive the need for SaaS technologies. 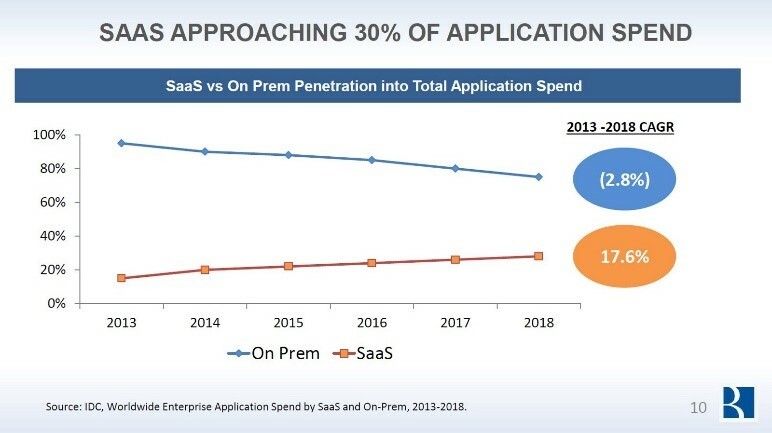 Over the past four years SaaS has slowly displaced traditional (on premises) application spend, and is expected to continue to do so into 2018 and beyond. 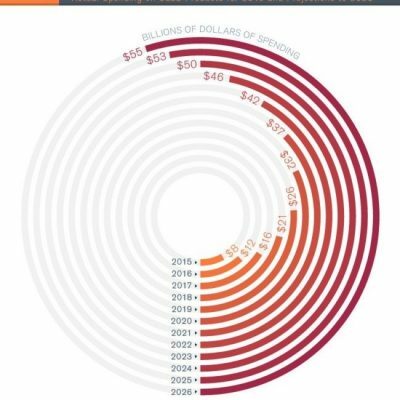 Additionally, spending on SaaS products is projected to grow from $8 billion to $55 billion from 2015 to 2026. Eventually experts believe that SaaS will become the expectation, rather than the disruptor. In the future they predict that the SaaS industry will cease to exist. 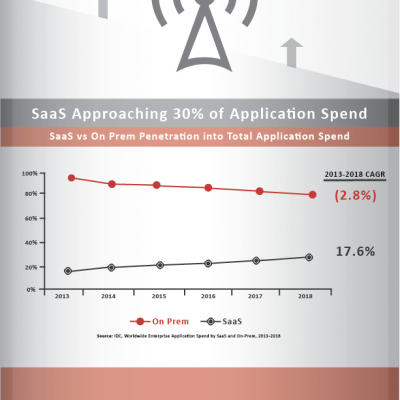 SaaS is expected to become so pervasive that all software will be delivered via the cloud. Mobility: Today 43% of business owners use their smartphones to manage business operations and this number is expected to grow as consumers demand more and more mobile-friendly management systems. This demand will drive the SaaS industry to create systems that allow for mobile marketing automation, sales enablement, web engagement, helpdesk, and email campaigns. Artificial Intelligence: Using artificial intelligence to increase the automation offerings in SaaS will streamline the user process and boost the efficiency and accuracy of the system. Additionally, integrating artificial intelligence into SaaS will expand the capabilities of the software and drive growth in the industry. 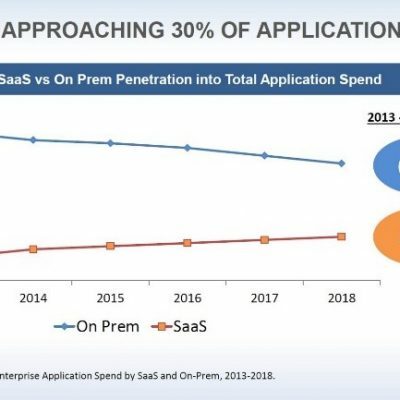 Unbundling SaaS: A new generation of start-ups are “unbundling SaaS” and offering software packaged as an API, rather than relying on the traditional model as offering software as a finished product. This allows customers to create their own software experience that is tailored to their own needs, increasing customer satisfaction and extending the capabilities. The expected rate of growth and impact of these trends differs between the two types of SaaS market approaches. Startups can approach the B2B software market either vertically or horizontally. In vertical approaches they create software for a specific industry (e.g. health care, real estate, finance). In horizontal approaches they create products that service a particular software function (e.g. marketing, sales, HR) but can work across many industries. Salesforce, Workday, and Slack are prime examples of horizontal SaaS. The horizontal SaaS market is more mature than the vertical one, and will therefore see lower growth rates. This market is characterized by a consumer base that is more familiar with SaaS and its benefits. It’s a highly competitive landscape with many big players offering similar products. It’s difficult for new entrants into this market to beat out these category winners. The vertical SaaS market is less developed than the horizontal one, and therefore has more room to grow as more industries adopt SaaS and more players enter the field. Vertical companies will need to continue to educate consumers on SaaS and work to become category winners. Execution speed will be crucial for companies hoping to establish themselves in the vertical market. At FiSci, we have made this SaaS model an integral part of who we are and what we do. We provide LTE as a Service (LTEaaS). This means we provide not just the equipment necessary to access LTE, but the full end-to-end LTE infrastructure throughout each step of the LTE service lifecycle, from Network Design to Disposal. With this LTEaaS model, we don’t just provide LTE infrastructure, we bring firsthand knowledge and experience to help you set up the system and overcome any obstacles you may face. We also keep you up-to-date with the latest improvements to our LTE technology and the proper training necessary to deploy the network in the most efficient manner. This is all included in your subscription costs. FiSci deploys LTE networks across many different markets, including ISPs, educational sectors, municipalities, public safety entities, and private enterprises. Our LTEaaS program can be considered as part of the horizontal market; it serves a particular function (providing LTE) that can be used across many different industries. Unlike most other categories in the horizontal market, however, LTEaaS is not a mature market. There are no competitors offering exactly what we offer. We are in a prime position to lead this category and drive its growth. Applying the SaaS model has enabled FiSci to grow at a much faster rate than it would have with a traditional model. The payment model of subscription fees allows us to offer this technology at a disruptive price point, making it possible for organizations and communities to afford our services. FiSci’s goal is to quickly deploy and expand LTE networks to provide internet where it may not be readily available. Applying this model to provide LTEaaS has made it possible for us to do this in the most efficient way possible. Relax. We’ve got you covered. By providing LTE as a service, rather than just providing LTE, we make the process of gaining high-speed internet access easier for you and your customers. With just your subscription fee it’s all taken care of. Click here to learn how our LTEaaS philosophy brought our service and our people to a rural Kentucky community to bring internet to thousands of underserved consumers. When you partner with us, you get more than just LTE. If you’d like to learn more, please feel free to contact us. How has SaaS changed the way you do things? Do you want to see more content like this? Let us know in a comment below.